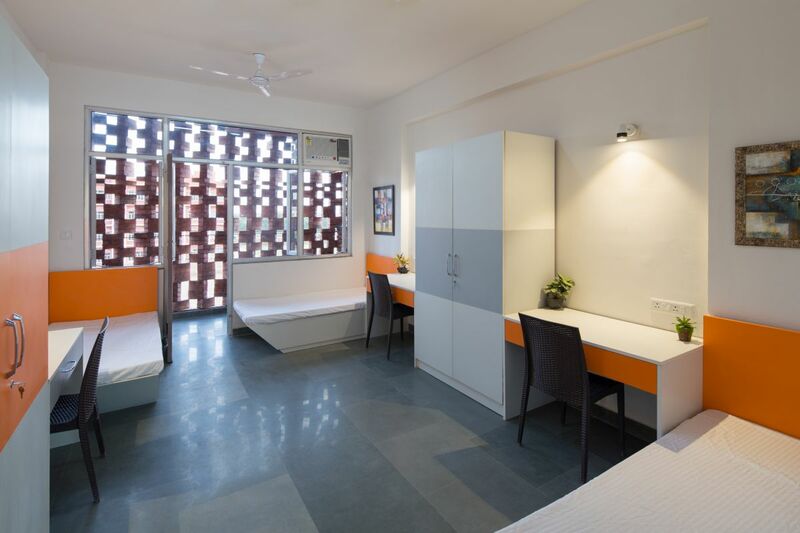 The boys hostel designed by ZED Lab houses 338 students with recreational and mess facilities. 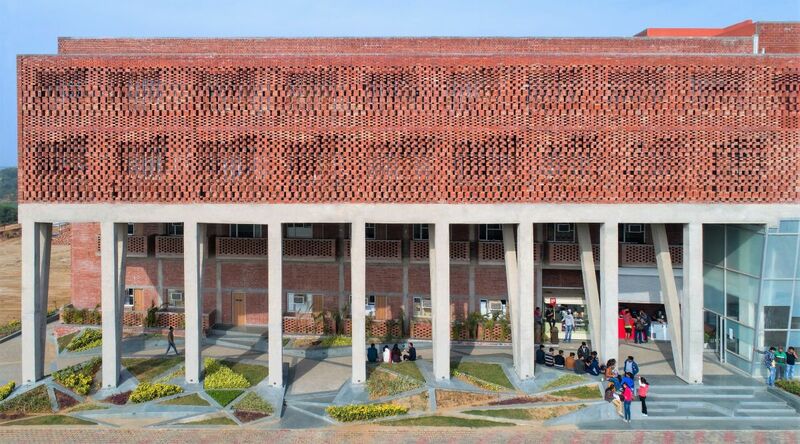 The building structure accommodates and cherishes student life. 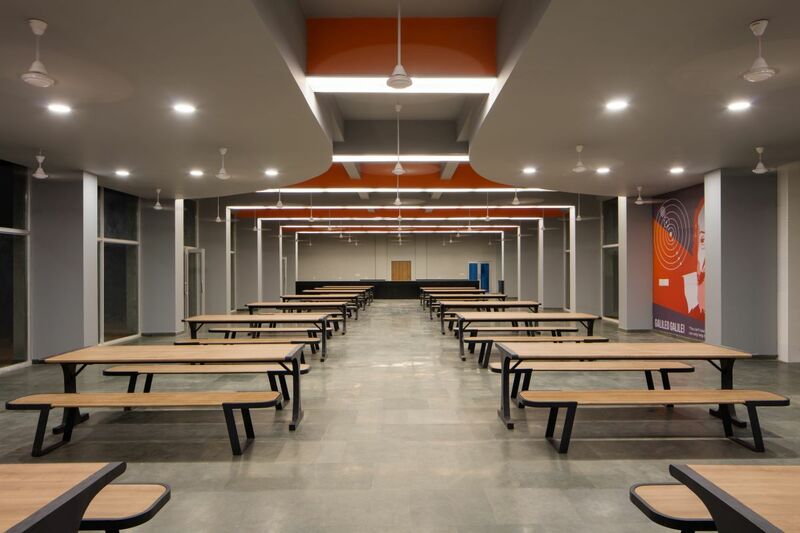 The ramp also supports informal interaction between the students, and creates an atmosphere comfortable enough to sustain long conversations and interactions, amongst the students. The dynamic stub columns that embank the sides of the building create visual interest and provide an intuitive closure to the volume that they contain. The mess halls are articulated with color and bright sunlight that spreads positivity. 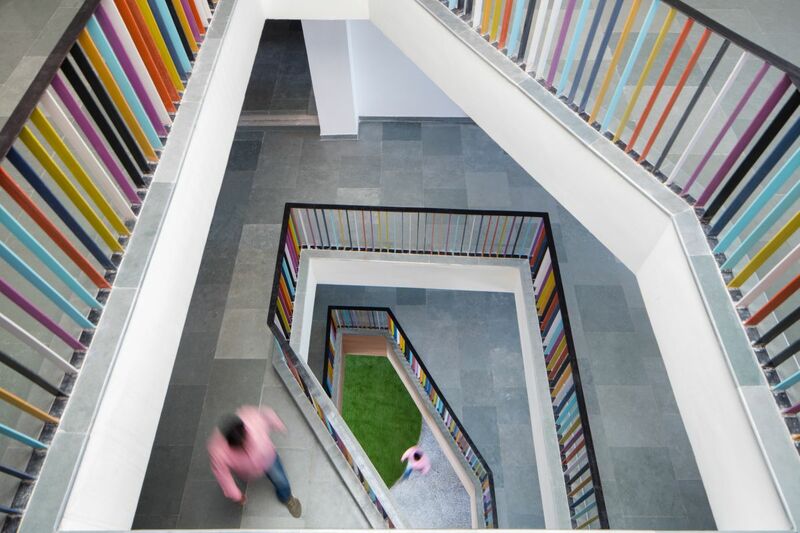 The central atrium of the building also caries forward the color themes. The floor to ceiling windows of the mess hall creates visual permeability across the building. These windows also open up to the landscape that abuts the building. Specific focus is put on the outdoor living that coincides with the indoor spaces. The relationship between the inside and outside is blurred and visual character of the building is dynamic from the perspective of both the person outside and the person inside. 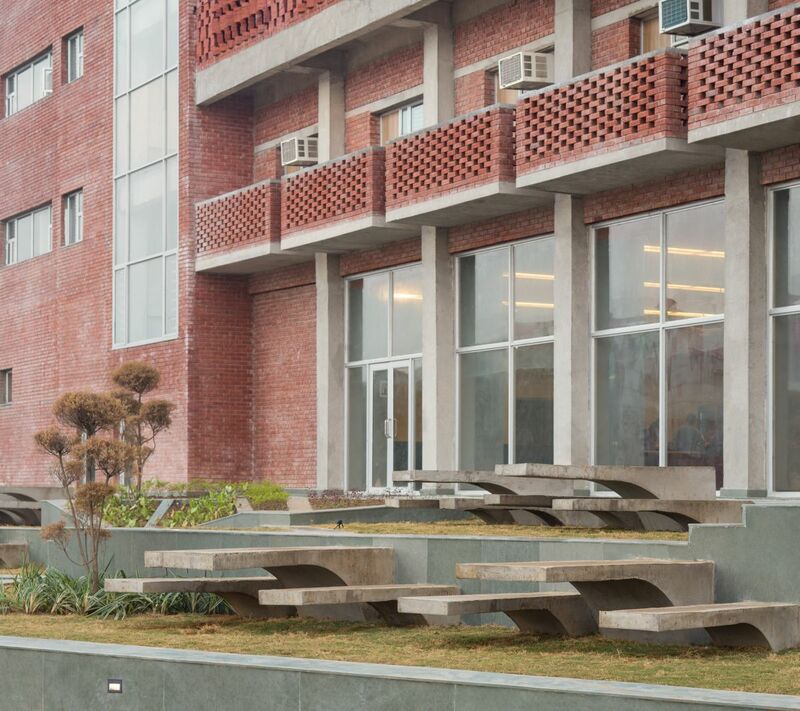 A terrace on the first floor celebrates and incubates the student energies with an open and extrovert character. 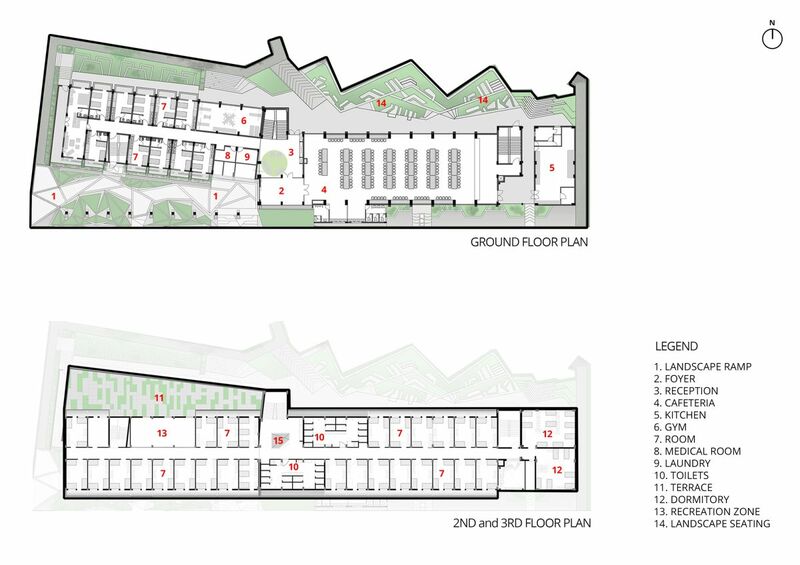 The indoor recreational halls are also located on the first floor, thus creating an active and high footfall zone that allows for maximum interaction amongst the students. 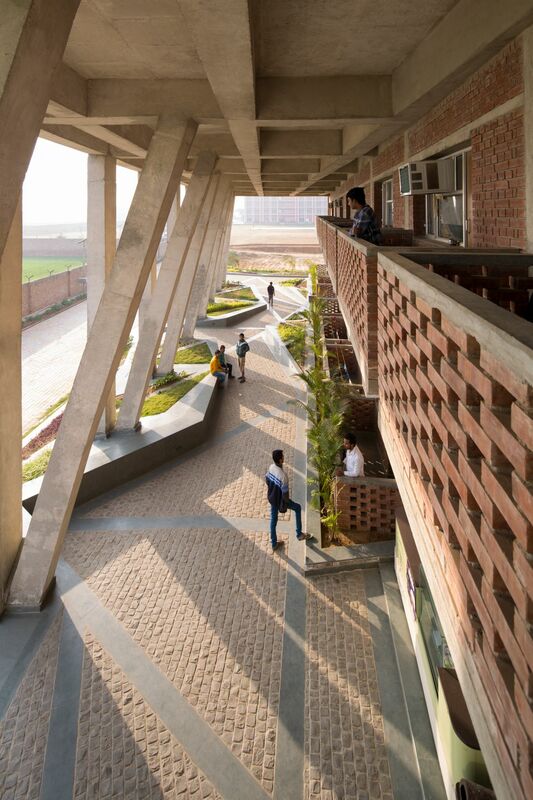 The terrace overlooks the playing field and establishes a visual dialogue with the overall context of the campus greens and other buildings. The form and dynamics of the brick computed through accordance to minimize solar radiations and thermal heat gain. 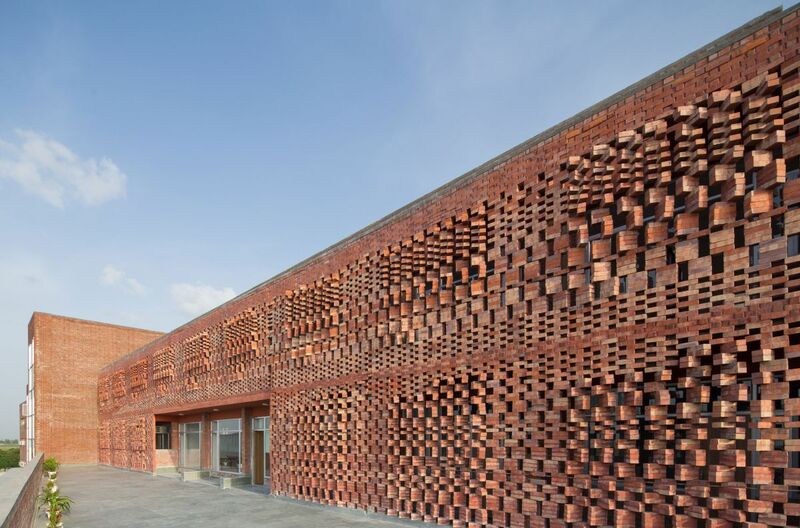 The brick jail creates a screen on the façade of the structure; one that allows for thermal insulation and light permeability. The jail also creates a unique character of light and shadow that renders a separate and truly different imagery for each of the rooms, used by the students. 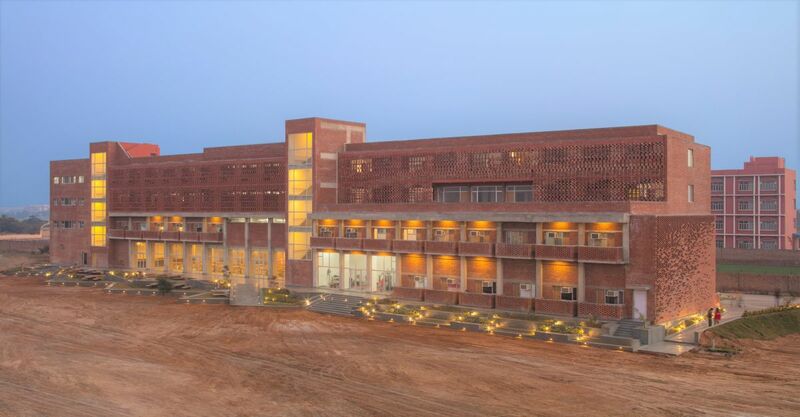 The boys’ hostel is supposed to house 320 students with recreational and mess facilities. 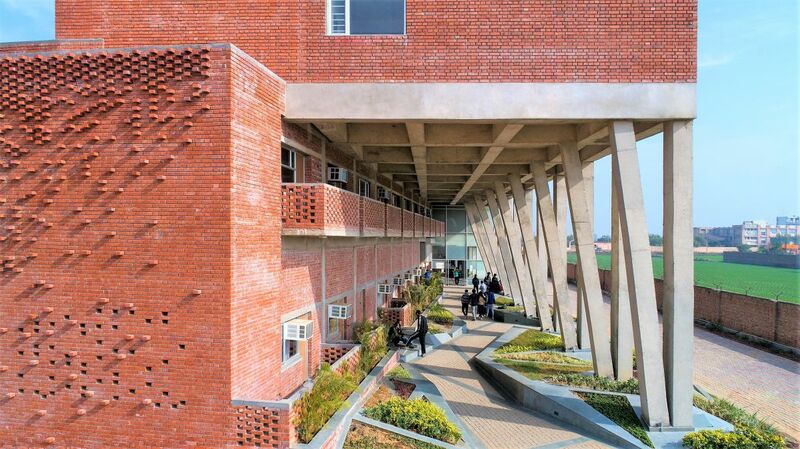 The building structure accommodates and cherishes student life. 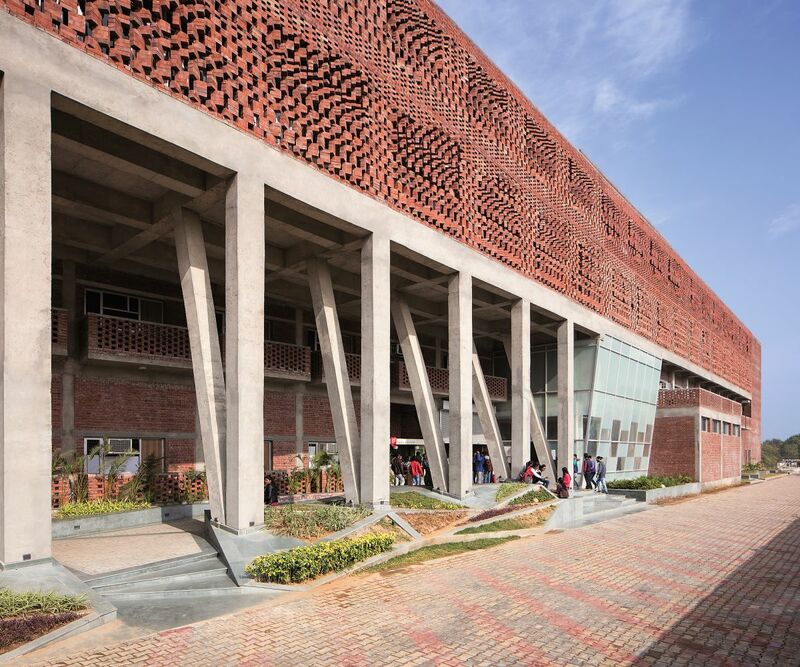 The entrance ramp of the building is a transitional buffer; it allows for recreation and also provides a shaded area for temperature of the students’ body to be accustomed to the temperatures inside. 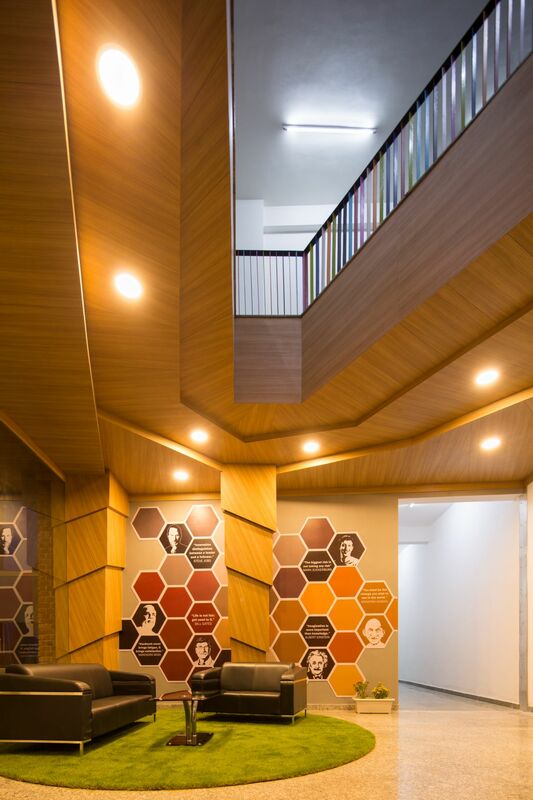 A terrace on the first floor celebrates and incubates the student energies with an open and extrovert character. 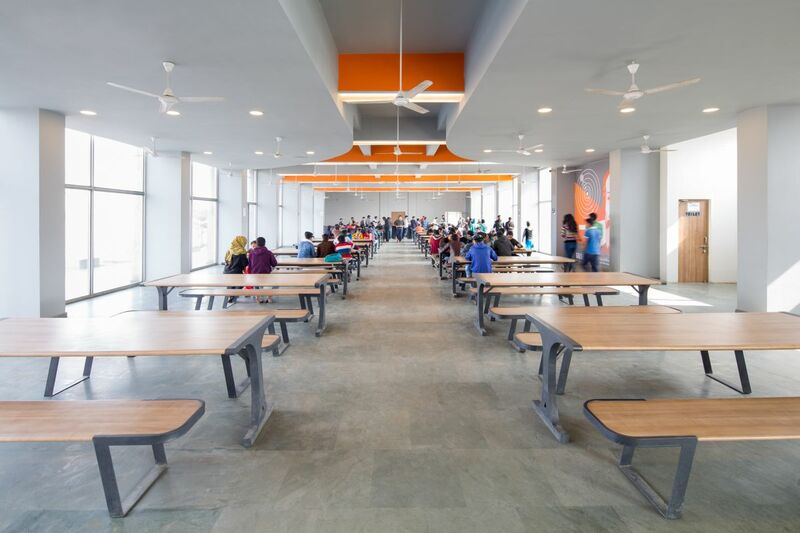 The mess halls are articulated with colour and bright sunlight that spreads positivity, the central atrium of the building also caries forward the colour themes. The building design started as a linear block which was then modified to minimise to solar heat gain by shading the southern façade. 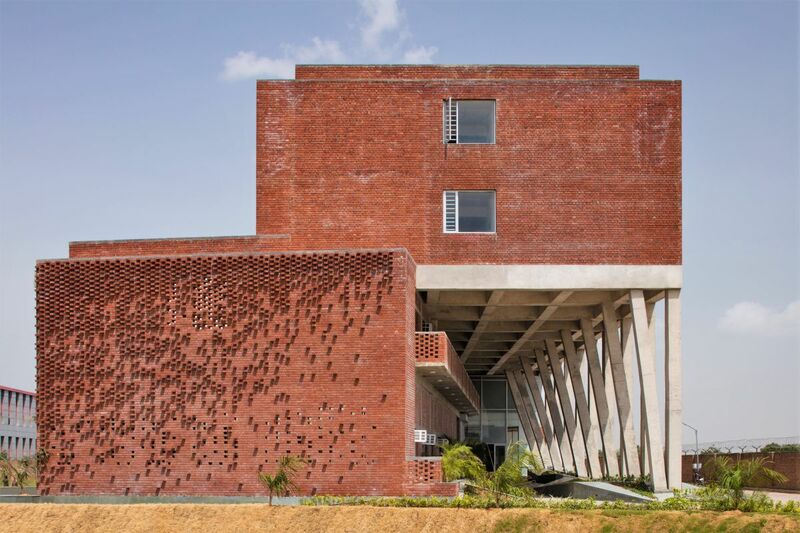 The twist in the form of the structure created the opportunity to accommodate multiple congregation spots, which are analytically planned as per climatic considerations. The entrance ramp on the southern façade acts as a transitional space that forms the summer court and on the northern façade the terrace forms a winter court for the students to unwind at the end of the day. Climate sensitivity has been an important parameter in our process, which followed, analysis of solar radiation and air movement to develop a second skin on the façade that allows for thermal insulation and light permeability at all time. 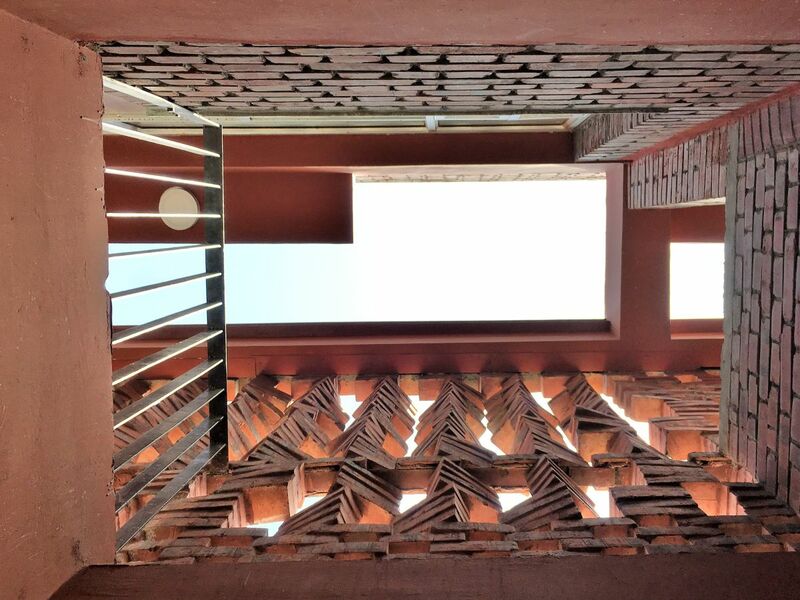 The jali also created a unique character of light and shadow that renders a separate and a truly different imagery for each of the rooms used by the students. The second skin accommodates balconies (4’ wide) which acts as a buffer zone designed to remain at mean temperatures between the inside and outside throughout the year. Using Rhino, Grasshopper and Ladybug a parametric script was written to analyse level of direct and diffused radiation on the primary façade. The radiation value of each grid cell on the primary façade then became the input for the rotation angles of the brick in front of it. By doing this, direct and diffused radiations were reduced by 70% on the principle façade. Hence, reducing heat gain on the principle habitable spaces behind the jali wall. Day lighting levels in the living units were also constantly checked to ensure that the jali does not reduce it beyond 250 lux. 21 feet high, 1” thick steel bars were fixed on the R.C.C beams using Hilti chemicals. Bricks were specially manufactured with single holes so that they can be stacked one on top of each other by inserting a single piece steel bar through the single whole. 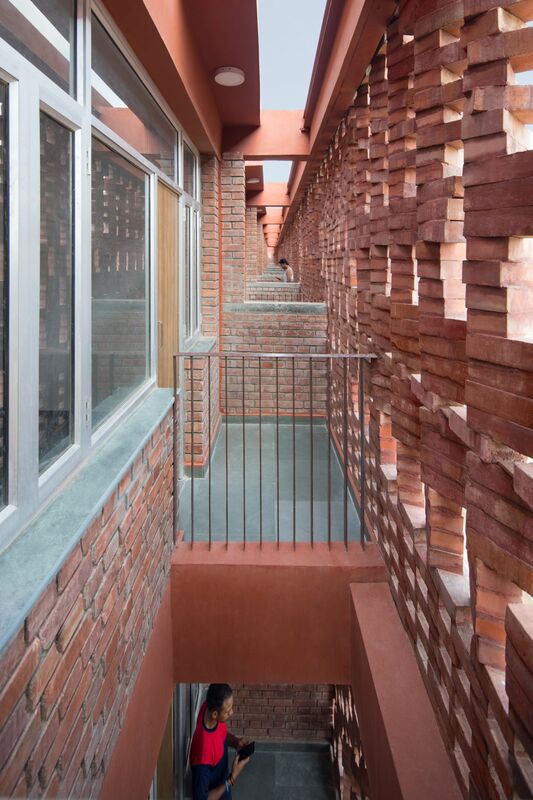 Based on the grasshopper script the brick were individually rotated on a specific angle to reduce solar radiation, provide adequate daylight and ventilation to the living units behind the skin. No cement mortar was used to construct the jail spanning 21 feet in height and 250 feet in length.